This page is your place for Minneapolis Moline & Twin City Tractors & Equipment. Many an old tractor still exists in the salvage yards and backroads. 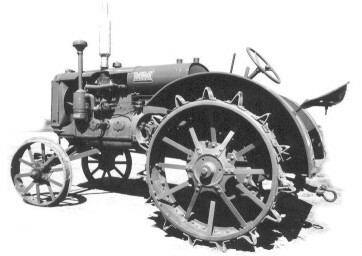 This old Twin City tractor was probably one of them. The photo was borrowed from the M-M Registry Home page (you can find it listed under the links on this page). Needless to say, there are most likely some more of these old tractors out there somewhere! If you would like to contribute "Minneapolis Moline Stuff" to this page....E-Mail us with the details and we'll see it gets attention.......Just make sure to include the word "Minneapolis" in the subject line! Jeremy Fiorelli's Twin City & Minneapolis-Moline Tractor & Pulling Page! T & H Creations, Inc. - A great on-line store for embroidered IH, International and Farmall tractor apparel. Company embroiders on every thing from Polo Shirts, T-shirts, Sweatshirts, Denim Shirts (Short Sleeve and Long Sleeve), Rompers, Kids T-shirts and much more. Twin City and MM Resource Page - Historical Information & Serial Number List.